One of the primary reasons for the rule of law and the presence of courts is to help resolve disputes without resort to violence and physical intimidation. Landlord/tenant disputes are among the most heated conflicts that courts and lawyers see, not surprising since they involve the home, a place that ideally provides people with a sanctuary from the world. Our San Francisco, Oakland, and Sacramento tenant’s lawyer helps ensure that the right to this feeling of sanctuary and home does not depend on whether one owns or rents. We help ensure tenants are granted the rights guaranteed by the law and the terms of their individual lease. A recent headline in the San Francisco Chronicle provided insight into what can happen when a dispute between a landlord and tenant escalates to an extreme. On Monday, fire engulfed a two-story, single-family home in Delmar, Maryland, a town of just over 3,000 residents on the Delaware border. It took approximately 70 firefighters an hour to bring the fire under control and damage estimates are in the $40,000 range. The Office of the State Fire Marshal and the local police have arrested Andy Modeste, age 42, on charges of arson and attempted murder. Authorities believe that Modeste, the property’s owner, set the fire in a crawl space while tenant Eduardo Machado and his family were asleep in the home. The family escaped uninjured. Fire marshal officials have suggested that a lease dispute may have been a key motive in the fire. Landlord/tenant disputes are common, although few rise to the level that one imagines must have existed between Modeste and Machado. While state, federal, and local laws include some fundamental protections for both tenants and landlords, a well-crafted lease can help prevent future disputes. California law allows for short-term oral leases that are binding on both parties. Oral leases are presumed to be month-to-month. However, as detailed in a tenant handbook provided by the Department of Consumer Affairs, even oral leases must be followed by a written statement from the landlord containing: 1) the name and address of the landlord or an agent empowered to accept legal notices; 2) contact details for the person who will accept rent; and 3) details on how the rent must be paid (i.e. cash, check, or money order). 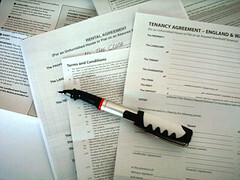 While other terms may be orally agreed upon and considered legally binding, tenants and landlords should recognize that they will most likely be unable to prove oral terms in court should a dispute arise. For this reason, we would recommend that tenants insist on a written lease even in the case of shorter tenancy periods. California law does require a written lease when the rental period is one year or longer. The written lease should contain all terms agreed upon by the tenant and landlord including the amount of rent, how often rent must be paid, and the obligations of both parties. Other terms that may be important include rules about pets, details on deposits and other fees, and obligations of both sides relating to repairs and maintenance (see “Ten Terms to Include in Your Lease” authored by Forbes magazine or “Essential Terms for a Lease Agreement” on LawInfo.com). The more you agree to upfront, the less you’ll debate later. A detailed lease will also allow a court to enforce the terms you agreed upon should a dispute arise during, or even after, the lease. The Brod Firm represents tenants throughout California. If you are a renter and your landlord has violated the terms of your lease or is in violation of the law, please call our office. Attorney Brod has helped tenants facing eviction issues including wrongful evictions, constructive evictions, and improper owner move-ins. He has also handled cases of tenant harassment, habitability issues, and lease violations. Call to arrange a consultation at one of our Northern California landlord/tenant law offices or a location convenient for you.